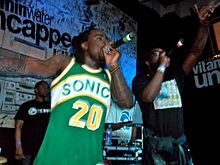 ^ "Folarin Season: Are We Entering A Wale Renaissance?". Vibe. September 17, 2018. Retrieved January 14, 2019. ^ "Album Reviews: Wale: Back to the Feature". Pitchfork. July 8, 2009. Retrieved March 11, 2010. ^ McGowan, Colin (July 10, 2009). "Wale: Back to the Feature". cokemachineglow. Archived from the original on December 16, 2009. Retrieved December 19, 2009. ^ "Attention Deficit Reviews – Metacritic". Metacritic. Retrieved October 29, 2013. ^ "K'naan, Wale Set To Kick Off East Coast Tour This Week". idiomag. Retrieved March 29, 2010. ^ "Wale Crashes Hulkshare With 'Eleven One Eleven' Mixtape Release". Vibe. August 24, 2011. Retrieved March 30, 2012. ^ a b "Wale Announces Ambition Tour". Rap Radar. September 7, 2011. Retrieved March 30, 2012. ^ "New Music: Wale f/ Miguel – 'Lotus Flower Bomb'". Rap-Up.com. September 28, 2011. Retrieved March 30, 2012. ^ "Wale ft. Rick Ross – Tats on my Arm". Nah Right. September 29, 2011. Retrieved March 30, 2012. ^ "Listen: Wale f/ Kid Cudi "Focused" (CDQ)". Complex. October 14, 2011. Retrieved March 30, 2012. ^ "Free Wale Concert In NYC on 11/2 – News Detail – Wale". Ralphfolarin.com. March 25, 2012. Retrieved March 30, 2012. ^ "Wale Announces New Mixtape "Folarin" | Get The Latest Hip Hop News, Rap News & Hip Hop Album Sales | HipHop DX". Retrieved November 15, 2012. ^ a b Horowitz, Steven J. (December 24, 2012). "Wale "Folarin" Mixtape Download & Stream". HipHop DX. Retrieved April 5, 2013. ^ Meara, Paul (March 4, 2013). "Wale Says He's Working On The "Nothing" Project, Talks New LP". HipHop DX. Retrieved April 5, 2013. ^ Horowitz, Steven J. (January 18, 2013). "Wale Reportedly Working With Jerry Seinfeld On "The Album About Nothing"". HipHop DX. Retrieved April 5, 2013. ^ Horowitz, Steven J. (February 14, 2013). "Meek Mill & Wale Hint At Collaborative Mixtape To Release This Summer". HipHop DX. Retrieved April 5, 2013. ^ Homie, Big. "WALE 'SIMPLY NOTHING' TOUR DATES". Rap Radar. FH. Retrieved January 11, 2015. ^ Zisook, Brian "Z". "Source: Wale Is No Longer Signed to Atlantic Records". DJBooth. Retrieved January 14, 2019. ^ "Wale Releases Surprise EP "It's Complicated"". HotNewHipHop. Retrieved January 14, 2019. ^ "Wale Releases Surprise 4-Track EP 'It's Complicated'". Billboard. Retrieved January 14, 2019. ^ "Wale Drops New EP 'Self Promotion'". Complex. Retrieved January 14, 2019. ^ White, Roman (May 9, 2018). "Wale Drops Surprise 4-Track EP 'Self Promotion' with Maybach Music". The Source. Retrieved January 14, 2019. ^ Halperin, Shirley; Halperin, Shirley (May 16, 2018). "Rapper Wale Signs With Warner Bros. Records". Variety. Retrieved January 14, 2019. ^ "Wale Feeds Fans With His New EP 'Free Lunch' Featuring J. Cole and Eric Bellinger". Billboard. Retrieved January 14, 2019. ^ Orubo, Daniel (September 14, 2018). "Wale Drops New 5-Track EP, 'Free Lunch' — Featuring J. Cole". Konbini Nigeria. Retrieved January 14, 2019. ^ Rathod, Nikita. "25 Professional Wrestling References in Hip Hop". HotNewHipHop. Retrieved August 27, 2018. ^ Pappolla, Ryan. "The New Day def. The Usos in the Rap Battle, hosted by Wale". WWE.com. Retrieved August 27, 2018. ^ "Noam Dar def. TJP". WWE.com. Retrieved August 27, 2018. ^ "See Nominees for the African Muzik Magazine Awards (AFRIMMA) 2014". Bellanaija. June 9, 2014. Retrieved July 28, 2014. ^ "Beyonce & Jay Z Lead 2014 BET Awards". Billboard. January 26, 2014. Retrieved May 14, 2014. ^ "Bet Hip Hop Awards Nominations". Archived from the original on February 23, 2014. Retrieved February 7, 2014. ^ "PAST WINNERS". Nigerian Entertainment Awards. Archived from the original on August 10, 2013. Retrieved October 30, 2013.